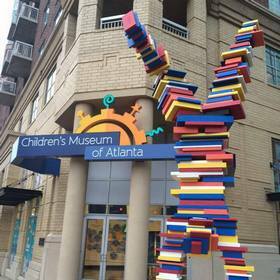 The Children's Museum of Atlanta strives to spark imagination and inspire discovery and learning for all children through the power of play. Whether you are a kid, parent or teacher, there is a section dedicated to you! The museum is divided into several different learning zones in the permanent exhibit hall and also has a “morph gallery” to show changing exhibits throughout the year. Parking: Parking garages are available throughout the area at the World of Coca-Cola and the Georgia Aquarium. Surface lots are located near the Museum. Please note that parking rates vary by lot and by downtown events and activities. MARTA: Exit the Peachtree Center Station and take the escalator up towards Harris Street (you will exit onto Peachtree Street). Cross Harris Street and go one block north to Baker Street and turn left. Walk three blocks towards Centennial Olympic Park. The Museum is located on the corner of Baker Street and Centennial Olympic Park Drive.